This website is about the Book Healthy Money Healthy Planet:Developing Sustainability through new Money Systems by Deirdre Kent. If you want to understand how our money system works, the problems it creates and what can be done to improve it, this is for you! The following review appeared in the International Journal of Complementary Currencies Research recently. It is by a Hungarian and I think it is the best review yet. It was followed up by a request to translate my book into Hungarian! Gillian Seyfang, who edited the IJCCR referred to my book as "one of the classics in the field" which is rather nice. HEALTHY MONEY, HEALTHY PLANET: DEVELOPING SUSTAINABILITY THROUGH NEW MONEY SYSTEMS. Although this book was published almost seven years ago, its statements today are more relevant than ever. The “Occupy Wall Street” movement sparks demonstrations against the social and economic inequality; earlier in 2008 we experienced a financial crisis, and now we are facing the eurozone crisis, and there is no end in sight... All these events show us that there must be something wrong with our “one-¬‐size-¬‐fits-¬‐all” economic structure and money system. We need a radical change. Deidre Kent’s book gives us a compass for understanding how money could connect, but not control people. Healthy Money, Healthy Planet: Developing Sustainability through New Money Systems explains Gesell’s statement: “They improved money exclusively from the point of view of the holder, with the result that it became worthless as a medium of exchange. The purpose of money didn’t concern them, and thus as Proudhon put it, they forged ‘a bolt instead of a key for the gates of the market.’” (Gesell, 1927) Kent elaborates on Gesell’s thoughts and the operation of the servant role of money: if and when it serves the community. In the first part of the book Kent gives an overview on the current interest-¬‐bearing money system, and problems associated with it. No wonder the author calls it ‘sick money’. In the first four chapters after a brief history of banking she discusses the economic and social consequences of current money system: the growing debt spiral, the widening income gap, the instability and other environmental, social symptoms. She argues for a new and better model of globalization, since the monoculture damages and destroys all other cultures and structures of life. The fifth chapter examines the use of GDP as an indicator of progress, better said: as an indicator of market activity. It is time to point out one of strengths of the Kent’s work: it explains why a new type of money system is one of the absent elements of the definition and interpretation of sustainability. The importance of communities, let it be a local body or a group of citizens, is the other absent element of the sustainability. That is obvious from her explanations. The last chapter of the first part is a very useful summary, it summarizes the counterarguments, which may support the current mainstream model and explains why a paradigm shift is inevitable. In the second half of the book we are introduced to the “Healthy Money” system. Kent prefers to define money not by its function, as others economics textbooks. Accepting Bernard Lietaer’s statement: “it is an agreement, within a community, to use something as a means of payment”(from B. Lietaer quotes on page 95). It should serve the community, so it should be the main part of the common property. Although the latter conclusion isn’t written word by word in the author’s text, it is implied: “The privilege of creating money to pass into private interests [...] is the most basic privatisation of all” (page 90). The next chapter (Chapter 8) is the most exciting part of the book. Not only because Kent sees economy as an organic whole, emphasising that it should mimic the patterns of nature and arguing for the model “economies nested within economies”, but also, because she formulates a new approach, which is barely known even after seven years: “The way of treating parts as wholes has been called ‘holarchy’ [...] such systems are more appropriate than hierarchies. Each living part is whole in itself and possesses something non-¬‐material and irreducible: a pattern of organisation.” She adds: “In an organic holarchic model, each economy -¬‐ supranational, national, regional, local and neighbourhood – would be a complete unit” (all citations on pages 103-¬‐105). She states that a healthy economy (just like the cells in the body) needs semi-¬‐permeable membrane to provide protection, consequently we have to decide how to regulate the different flows (capital, goods, etc.) effecting our economy. The holarchic view gives guidance for the communities to construct their own healthy money systems. Chapter 9 organizes the social benefits of community currencies, the next 40 pages present the different forms of complementary currencies all over the world – the reader may find a very useful systematic overview in Appendix I about the classifications of currencies and the comparative table following this (page 289-¬‐294). The different LETS initiatives (Chapter 10), the commercial trade barter systems (Chapter 11) and the perishable money systems with demurrage (like Wära, local shillings in Wörgl, Stamp Scrip, Simec, Chiemgauer) are described in chapter 12. The next chapter (Chapter 13) describes business-¬‐issued currencies, including the pre-¬‐paid vouchers schemes and a privately issued fiat currency (Chatham Islands notes). Chapter 14 shows us a very new type of complementary currency: Richard Douthwaite’s energy-¬‐backed currency unit and Bernard Lietaer’s terra. The last four chapters give us a synthesis for the whole book, together with the above mentioned Appendix I to deepen our knowledge. The list with its 16 points on page 202-¬‐204 could be seen as the most important aspects for the stakeholders. Following that Kent emphasises some very important questions, e.g. legality by the government, acceptability by the users, convertibility, tax issues, etc.... Kent does not avoid mentioning the phenomenon, that instead of having more and more diverse currencies, the world is moving towards fewer and even more monopolised currencies. She mentions four different disadvantages for common supranational currencies – all this prevail now during the time of euro-¬‐crisis. Chapter 18 deals with community banking in New Zealand and in other parts of the World in 20 pages. Let’s quote the words of a Hungarian holistic ecologist, József Agócs: “The trouble of the world is not that we are doing something the wrong way. The trouble is that we do wrong things. If we Ainally did something of value, even poorly, the results would be better, even if not perfect.” Deirdre Kent’s work helps us create a well-¬‐tuned money system. This book should be of interest to activists and researchers as well. Activists get a lot of information from the glossary of definitions, from the useful websites and the list of organizations. The detailed bibliography and the 20 pages long list of end notes stimulate further research. Szaly, Z. 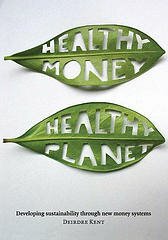 (2011) ‘Healthy Money, Healthy Planet: Developing Sustainability through New Money Systems’ book review. Reviewed for the International Journal of Community Currency Research 15 (C) 5-¬‐6, www.ijccr.net ISSN 1325-¬‐95475. Tomorrow I find myself speaking at not one but two meetings about our timebank. How to start one seems to be the in-thing. Now why would an inner city suburb of our capital city have a talk on a local currency like a timebank? It probably isn't because they are broke (local currencies thrive in hard economic times) because the average salary in Wellington is the highest in NZ. It is possibly to build community cohesion to insure them against crises like earthquakes. The other talk (Ben is doing the main talk and I am just there to back up, knowing the history of our Otaki Timebank) is at Paraparaumu. A keen young woman started a Facebook group and it is through that group the event has been advertised. The Kapiti Coast is like the suburbia Kunstler talks about as being the most expensive experiment ever done by western nations. It is spread out. Lyttelton has been a huge success as a timebank having been going over five years now. Margaret Jefferies is an inspiring speaker and has done a stalwart job over that time. Lyttelton is geographically clearly defined and the houses are all within a smallish area, whereas Paraparaumu, Raumati, Waikanae, Paekakariki is spread out over a narrow strip of coastal land. Quite a different profile. I have also had a call from someone in Johnsonville and a woman in Tauranga about how to start a timebank. Must get in touch with Margaret, because it is they that have the funding to support new timebanks now. They are nearly recovered from the resignation of their coordinator and in a month will be up and running well. Just been to Kapiti Coast District Council where I accompanied my husband Malcolm Murchie. He was giving a submission on behalf of the Democrats for Social Credit and it was quite good. He spoke of the growing debt of KCDC, now at $99 million. It grows each year because they only pay off $5m a year though they pay $6.7 in interest to overseas owned banks. The request was that KCDC takes a remit to the Local Bodies conference asking for Reserve Bank credit at zero or very low interest rates. Total debt of all local bodies in NZ is $6.5 billion. A reasonable request and now he needs to find a councillor to champion this and at least have their discussion held in public. Otherwise they will discuss it and dismiss it quickly while in committee. We had sat through very worthy submissions from small local groups like the Te Horo ratepayers asking for a few thousand dollars, and the Lions club and the Surf Club. The amounts are tiny in comparison with $6.7 million of potential savings, money wasted in interest. I have been contemplating what is going to happen economically as things come to a head on the international financial scene. The European Union is in trouble with Greek, Portugal, Italy and Spain being in such severe debt and Strauss Kahn who would have rescued them is in jail. Last night the European sharemarket dropped. Collapse is bound to occur one day soon. The Irish originated book Fleeing Vesuvius is being published by Living Economies soon, explaining what could happen as demand for oil finally outstrips the supply and how an economy can no longer grow after peak oil. The economic system is set up to demand economic growth and with resources finally meeting geographical limits it is all going to stop. In fact Richard Heinberg says the global economy stopped growing around Sept 08 when there was a collapse in oil prices. What with the price of food continuing to rise, and the price of house insurance about to rise by 50% because the reinsurance companies can't deal with two Christchurch earthquakes, a Queensland flood and a Japanese tsunami, we are all going to be in dire economic straits soon. If the TPP free trade agreement goes ahead then the price of medicines may also rise. Rob Hopkins, founder of the Transition Network, said on his blog the other day that we need to move now from peak oil and climate change to the strengthening the local economy. Of course I am in favour of local currencies. In their economic crisis in 2002 Argentina didn't only have a plethora of local currencies, but their government legislated to allow regional governments to issue their own currency. Local currencies can never scale up to the needed $6.7 million required in the Kapiti District Council area. So it is either going to be a regional currency or we will have to get Reserve Bank money as US did in the big financial crisis, though it was called "quantitative easing" to give it an aura of mysticism and noone could understand what it was. I guess as things get worse, we are going to stagger towards all these solutions, but all too late to prevent terrible suffering. The first 1/4 of this book spends some time explaining how our current money system works and spelling out some of the implications: eternal debt, pressure to exploit more and more natural resources and concentration of wealth and power. The other 3/4 of the book talks about solutions; complementary economic and monetary systems which have been tried all over the world and documents their successes and failures. There is a strong relevance to us in New Zealand, as it has many current examples of things that happened or are happening here. A vision of overlapping local, regional, national and international currencies that function in an ecological fashion is presented, which although appealing is probably too breathtaking in scope for most people to stomach. Maybe it'll come to pass, but certainly not all at once! After finishing this book you will have a firm grounding in the basics of a wide variety of different approaches to money and an awareness of how to avoid some obvious (in hindsight!) mistakes that others have made in the past. I highly recommend this book for anyone who is interested in LETS or complimentary currencies or who is in need of inspiration on how to respond to the ongoing financial collapse. Thanks to Geoff and Naomi Waterhouse, Ken Ross and the Far North District Council I was able to respond to their requests to speak to several Transition Towns groups on the issue of money. There were 70 at Kerikeri, 25 at Kaitaia, 75 at Whangarei and 20 at Kaiwaka. The format was to show the film Money as Debt followed by a short discussion, a break, a short powerpoint where I outlined the designs of various community currency systems, and then discussion. A big challenge! I remain more convinced than ever that the 47 minute Canadian documentary on money showing what a pernicious and unsustainable system we have inherited over the centuries, that this film teaches it brilliantly, with animation and clarity. Now the case of Kaiwaka has set me thinking. Gail Aitken who had been a member of a LETS system in UK, had set up a small LETS after coming to Kaiwaka to an intentional community at Koanga Gardens. If measured by the trading volume per member, it is a very successful scheme. It has only 40 members but they all know each other extremely well. There is another intentional community involved and a few from the small township of Kaiwaka, an hour south of Whangarei. The purpose of the discussion was to work out ways to improve their scheme. Gail runs it using just a spreadsheet. She is paid by the system in the local currency, the kauri. They don’t use the internet and the members showed no desire to be dependent on the internet as they believed the LETs was more resilient that way. Afterwards I was pondering. I was thinking about the Time Banking model in Lyttelton which has a Community Chest as a member. An interior design company had done some work free for the system and been credited with Hours. The company donated their hours to the Community Chest so that those who had no time or health to work for others could be supported. I spoke to one of the administrators of the Kaiwaka system afterwards suggested that if their system tended to be blocked by people with large credits they didn’t particularly want to spend, then they could look to the time bank model and set up a community chest. In that way the solo mother could be cared for while she was doing her child care. “In a way you are setting up a mini social welfare system within your circle”. He was fascinated by the idea. My other observation was that Kaiwaka may be a model for others wanting to set up mutual credit trading circles without the Internet. Each of the types of currencies could forge links with the others, with exchange rates being determined regularly, thus extending the variety of goods and services available, and giving members a better experience still. Perhaps there could be a network of LETS systems on the web and a network not on the web. After all when you think of what is happening in the soil in the root system of any plant, there are millions of small fungi, bacteria and working. There is an ecosystem of millions of tiny micro-oganisms where nutrients and energy are exchanged to everyone’s benefits. Feedback loops tell where the needs are and the surplus resources. We have often talked about how important it is to develop trust and bonding in a community before a community currency can be successful. Well, why not skip this step and go to communities which already have done their bonding and teach them to set up a mutual credit circle for trading? As the global economy collapses around us, local bowling clubs, schools, maraes, Rotary clubs, sports clubs and RSA’s will be amenable. Why not have a series of small interlinking LETs systems in a small town or suburb, rather than one big one? That will give us more administrators, more resilience, more innovation and bigger numbers, vastly improving the experience of community currencies. If they include in each scheme a Community Chest it would be a lifeboat in the case of a ravaged centralised benefit system. This would prepare for the huge scale movement of the newly unemployed city members returning home, complete with their alcohol, debt, drug and gang problems. As the international banking system goes through its reform spasms it is critical to develop mini local models under the radar as well. To start a new bank now costs a prohibitive $30m, up from $15million recently. I am in mind of a Samoan woman who told me during Mike Rowbotham’s visit early this decade that they had systems where members paid a certain amount per month into a pool and at the end of the month there was a draw for an interest free loan. If someone didn’t want it they drew again. As the reformers of the national currencies of the world and the banking system of the world get into action over the next few years, so will those who are building a new money system at the flaxroots level. I have often thought we need a conference to work on a new financial system –Permaculture Economics? Soilweb Financial Systems? A conference gives face to face contact and may attract those working at higher levels as well. Thomas Everth writes a regular green blog for a Coromandel paper. He writes a monthly a column under the title "Green Blog" for his local paper the Coromandel Town Chronicle. A copy of Novembers edition (minus the last bit on another topic) is below. One of the main topics of this years Eco Show in Taupo – and timely so – was the state of our financial systems and how their current construction might be the underlying root cause of much of the world’s problems. Few people realise – according to Deirdre Kent, one of the speakers on these issues and member of ‘Living Economies’ and author of ‘Healthy Money, Healthy Planet’ – how money is created in this country and around the western world. Most of it is not created as physical currency, the paper notes and coins you can carry in your wallet by central banks and governments, but as interest bearing dept when individuals, governments and businesses take out loans from lending institutions at the stroke of a pen as a balance on a bank account held against some collateral (a property, your future income etc.). The problem with this is that the banks create the principal of the loans at the stroke of a pen for you to spend, but not the interest they expect you and everybody else to bring back to them. This causes the entire system to be in constant need to expand and to create more money - as further interest bearing dept - so that the interest of previous loans can be paid. This system only works if even more money is created and as long as the value and the amount of the underlying assets upon which loans are given also rises. In fact the entire financial system only works if and as long as it keeps growing. You will have heard it from most politicians: “We need the economy to grow by x% per year”. But if you grow something every year by a percentage of what you already have then you get “Exponential Growth”. In nature there are no stable systems that allow exponential growth to go on. Simple math will tell you that a single penny invested at 5% compounding interest 2000 years ago would today be worth 134 billion balls of Gold each the weight of the Earth at the 1990 gold prices! You will probably need to read this a few times to comprehend these numbers but its true. Exponential growth always leads to a catastrophic end and the only cases of exponential growth in natural systems are quickly self-limiting. Take the exponential growth of yeast bacteria in a brewing vet as an example. The bacteria grow exponentially until the concentration of the yeast’s excrement (Alcohol) is killing them off. Another example of exponential growth of cause is Cancer. Exponential growth is unsustainable when you live on a finite planet. And even if we had a whole bunch of planets it will not work for very long as the example above shows, where the exponential growth of a single penny devours just about every bit of matter in our Galaxy in the short order of just 2000 years. Our exponential growth dependent financial systems must therefore fall over every few generations in a wave of deep destruction before they can carry on growing again until we one day perhaps might come to our senses and develop a steady state economic system and live like all enduring natural systems in a state of balance and harmony with our environment. Let’s for argument sake include all the people that will live in the next 7 generations when we take a democratic vote on our actions today. Why not? The fact that they are not able to speak yet should not be held against them. Why should we deprive them constantly of all their rights? Imagine what the actions of our democratic system would be then? A steady system that would give enduring sustenance to humanity and all natural systems upon which we depend? I bet! Just when you thought you knew about how to save civilisation through turning off lights using public transport of driving less, Deirdre Kent confronts us with an unpalatable truth. The world's money system is designed so that the money supply and hence the size of the global economy must keep on increasing exponentially or it will collapse. Kent's book is one of many on the money system, books that are rarely read because people think they can't understand economics. However this book is clear and easy to read as many reviewers have discovered. Kent spends a third of the book explaining how the current money system is sick and the rest describing the huge array of local currencies available currencies which are created without interest. The reviews of her book include Management Magazine, who say "Deirdre Kent, previously the tenacious leader of the country's anti-smoking lobby, has written an impeccably researched book that deserves to be read. It discusses, in an agreeably jargon-free and readable fashion, how the current system works, or doesn't." I live in Otaki, an hour north of Wellington on the Kapiti Coast. I am 76 and my husband is 89. When I am not working out how to feed my husband or organise the garden, my passion is working on new economics and its politics.